Miss R LOVES sushi. She had her first encounter with raw fish and sticky rice at the tender age of three, gleefully pressing the pink and white parcel into her little mouth with the relish other three year olds might have for a chocolate bar or burger. Unfortunately, when she was young, Scotland might as well have been Mars when it came to finding Japanese food, so we were rarely able to indulge her. Even fish shops very rarely stocked the quality of fish with which to make your own sushi and sashimi. But gradually over the years the restaurant and fishmonger situation has improved and we can now make sushi as often as we like – or as often as the purse allows. For one of Miss R’s birthdays we even had a sushi making party, which was great fun even if I was picking rice out of the carpet for days afterward. Five years later I still vividly remember one bold boy sucking down the contents of the wasabi tube and trying desperately hard not to cry. I can’t pretend to be an expert on sushi. As I am self-taught in this art, my efforts would probably appall a 10-year apprenticed sushi chef. But I can’t afford to frequent sushi bars very often, so Miss R and I make do by rolling it ourselves with the freshest ingredients. Even though Mr A is the only one in our house to have visited Japan we all love sushi, sashimi, miso and all the other delicacies of this most refined of cuisines. I love the ‘clean’ flavours, precision and attention to the tastes – sweet, salty, bitter, sour, spicy (many will debate this one) and umami. This last taste – denoting meaty, savoury, yeasty flavours – is a Japanese word that roughly translates as ‘savouriness’ or ‘deliciousness’. This word and concept covers the often indefinable tastes we sense in some foods, and has filtered into British culinary thinking by chef Heston Blumenthal and in the US by David and Anna Kasabian – see the Umami Information Center for more about this subject. You can even buy umami paste to add to dishes. I used to think I liked salty things but I now realise that umami, which often pairs up with salt in savoury foods, such as Marmite, is really what I like. It’s only taken 40 something years to figure that out. It explains why I love parmesan cheese, tomatoes, shiitake mushrooms, fish sauce and black olives – all high in free glutamate acid – an amino acid that is the hallmark of umami. 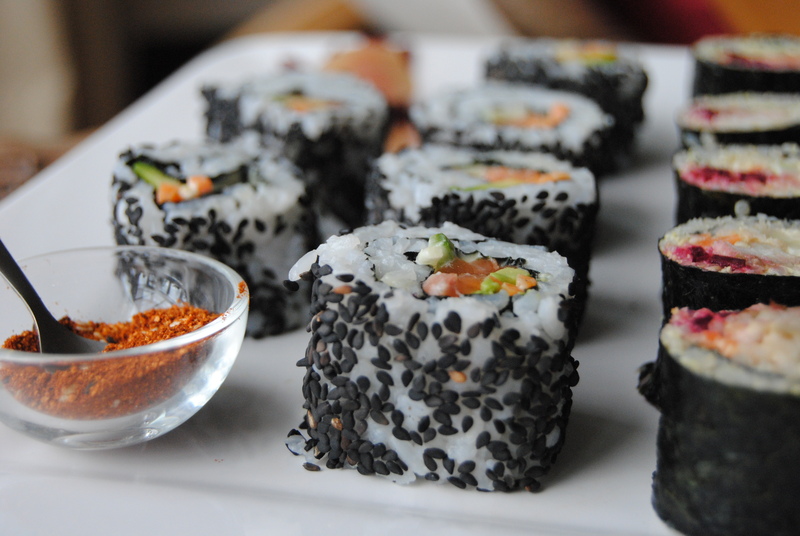 With sushi, you can play with taste elements to great effect emphasising, say, salty and umami (smoked eel + sushi seaweed/nori) or sweet and spicy (mayonnaise and peppered mackerel). I like to add in hot, sour and bitter garnishes such mustard-hot wasabi, pickled sushi ginger, spicy togarashi (here’s my recipe) powder and salty-sour umeboshi paste to satisfy my craving for taste contrast. But even a slug of Kikkoman makes a brilliant partner for sushi. I have always thought that the two keys to good sushi are super fresh fish and properly cooked sushi rice. Well, I have amended this slightly to also include properly cooked quinoa. Yep, quinoa. My friend Niki gave me the idea after she wanted to make the first recipe that I posted, smoked mackerel and quinoa fishcakes, but didn’t have all the ingredients, so made a sort of sushi thing instead. I don’t know what she ended up putting in this invention but I’m positive it was delicious. This was a stunning revelation as, although sushi is super healthy, it isn’t all that low in carbohydrates. We need carbohydrates and I don’t have any truck with the lingering fad for high protein-low carb diets that may end up wrecking your kidneys, but I do believe that we should include more unprocessed, ‘brown’ carbohydrates. You can of course use brown sushi rice to lower the GI rating, but I can never get it to work as well as the white stuff. So the near-sacrilegious substitution of rice for quinoa struck me as rather genius. And it worked, beautifully. 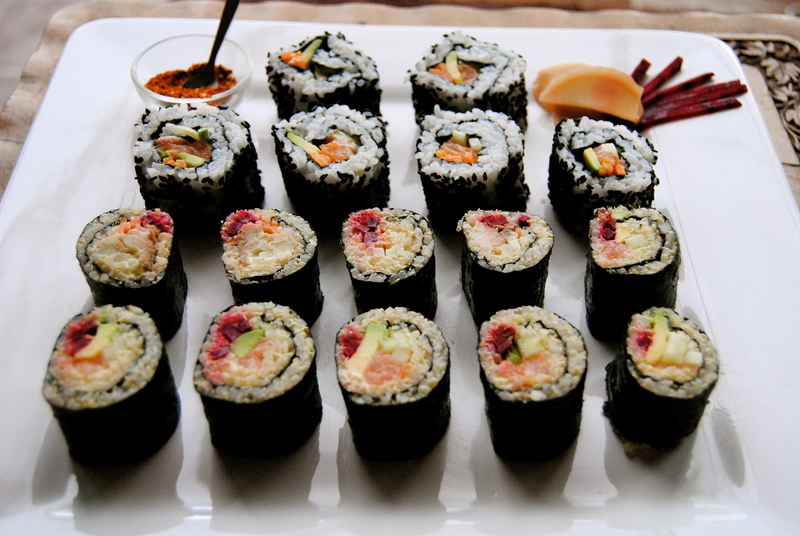 Sushi doesn’t have to involve raw fish. By all means use just the smoked mackerel, or maybe try some smoked salmon, quality tinned or jarred tuna, chicken, cooked prawns, crabsticks (which are a complete misnomer but perfect here) or keep it veggie. This is made for ‘free-styling’ so put in what you like and what you can neatly roll up. 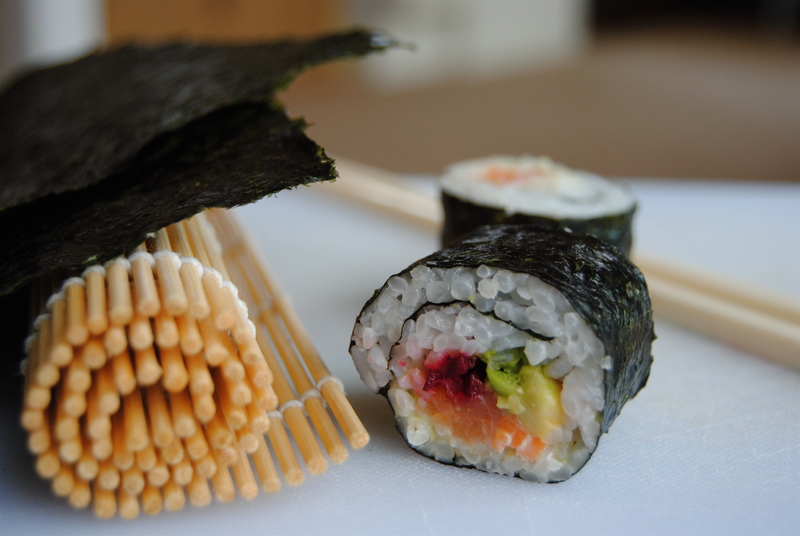 Kids are sometimes a bit funny about the look of the seaweed, so get round that issue by rolling it up as inside-out rolls, with the seaweed safely curlicued up inside the rice. It takes a little more skill, but only just a little. I will guide you through the steps but there are plenty of on-line videos to help too. Here’s one on California rolls. Vegetable fillings: thin strips of cucumber, avocado, carrot, beetroot, spring onion/scallions – but use any vegetables that you like such as shiitake mushrooms, peppers or mooli. You Also Need: a bamboo sushi rolling mat, Japanese condiments such as togarashi, umeboshi, pickled ginger, soy sauce/shoyu sauce and wasabi – get all of these in Oriental supermarkets, some mainstream supermarkets or online; bowl of clean water, sharp knife, cutting board, cling film, foil or large baking tray. The rice is the only bit that you kind of need to get right as the rest is just to your taste. Wash the rice in cold water until the water runs clear: I do this in a sieve. Pop it into a lidded saucepan and add in the 360 ml water. Leave it to soak for 15 minutes then bring to the boil. Cover and lower the heat to simmer for 10-12 minutes or until the water is absorbed. Remove from the heat and leave, covered, for 10 minutes. You can do all of this ahead of time and bring up to room temperature before making your sushi, but I find it is best if you use freshly made rice. While the rice is cooking and waiting you can get on with sorting your fillings and work space. Mix together the vinegar, sugar and salt until dissolved. 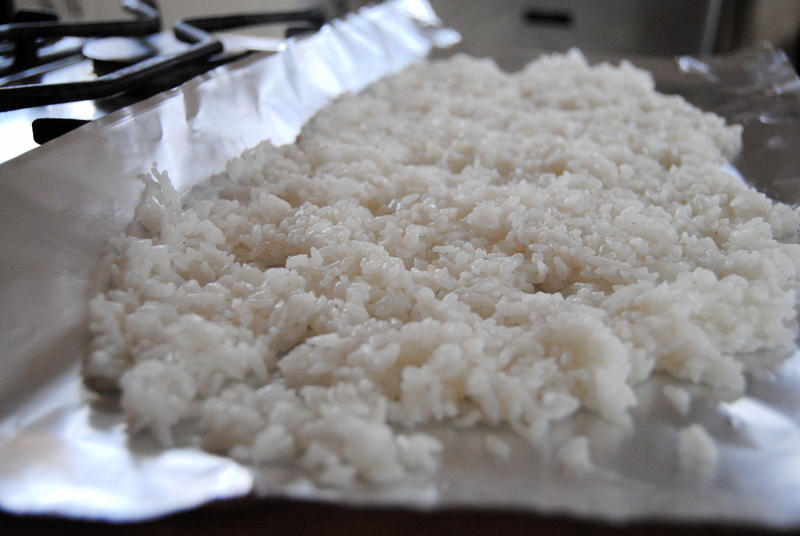 When the rice has rested spread it out onto a long sheet of foil or onto a large baking sheet, sprinkle generously all over with the the vinegar mix. Fork the rice around to mix the vinegar solution. Experts say to fan the rice as it makes it glossier. Now you are ready to roll! 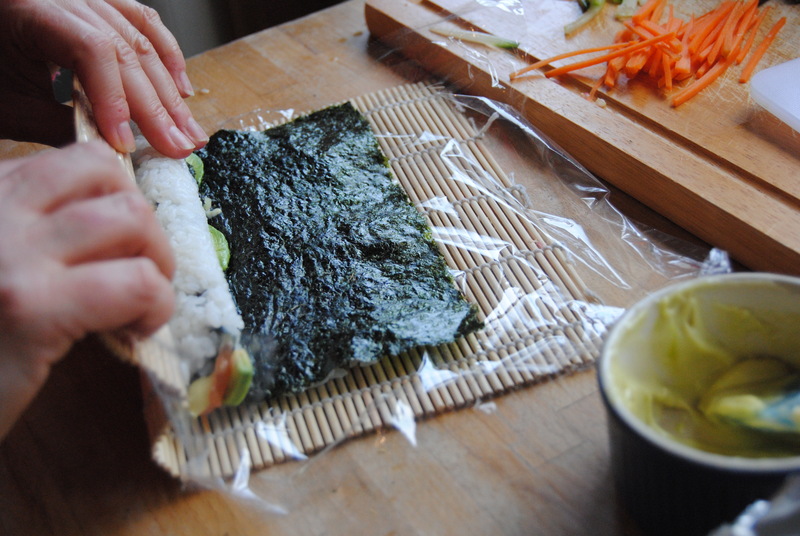 Place your rolling mat on your work space, lay one piece of nori on the edge closest to you. If you are having a shot at the inside-out rolls then trim off the top quarter with a pair of scissors. 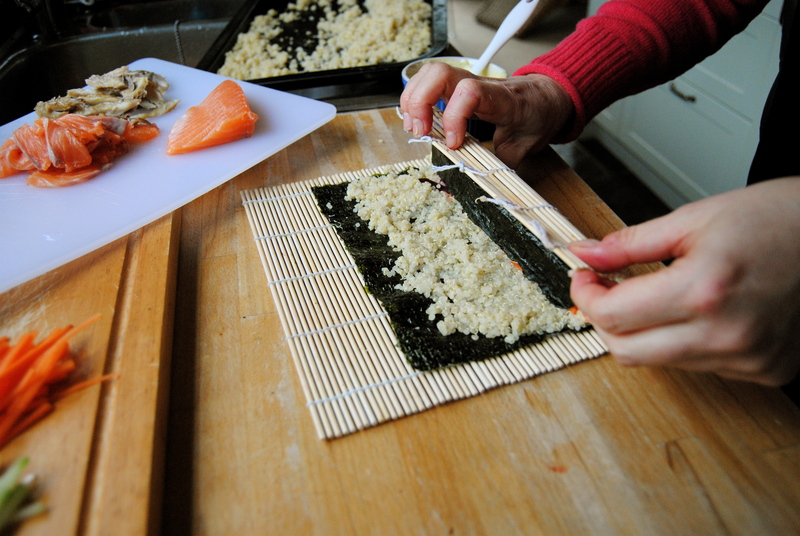 Spread some rice onto 3/4 of the nori, leaving the top quarter bare, or up to the edge for inside-out rolls. Dip your hands in water and clap to remove excess. Doing this regularly while smoothing on your rice will keep it from sticking to your hands too much. For regular maki sushi lay your fillings in a line, one-quarter from the bottom edge (see photo), starting with the mayo or umeboshi, if you like. Don’t be tempted to pile on too much or it will be trickier to roll up. I usually use about four fillings at a time. Once all of your toppings are on start rolling from the bottom edge, using your fingertips to guide and contain the filling as you roll away from you. 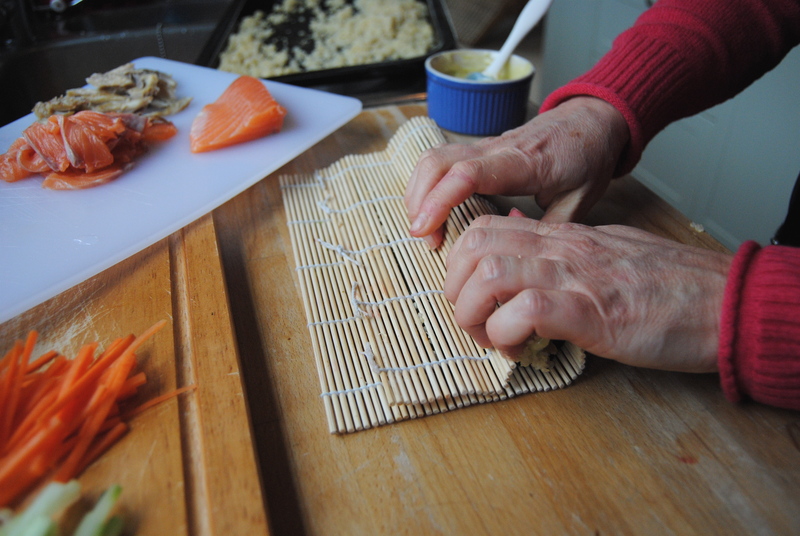 Take your time, gently squeezing as you roll, using the mat to push the seaweed roll forward. You will hopefully end up with a neat, tight sushi roll. Trim away any filling peeking from the ends and set aside while you set up another roll. When they are all completed cut each roll into 6-8 pieces and place cut side up on a platter along with your condiments. 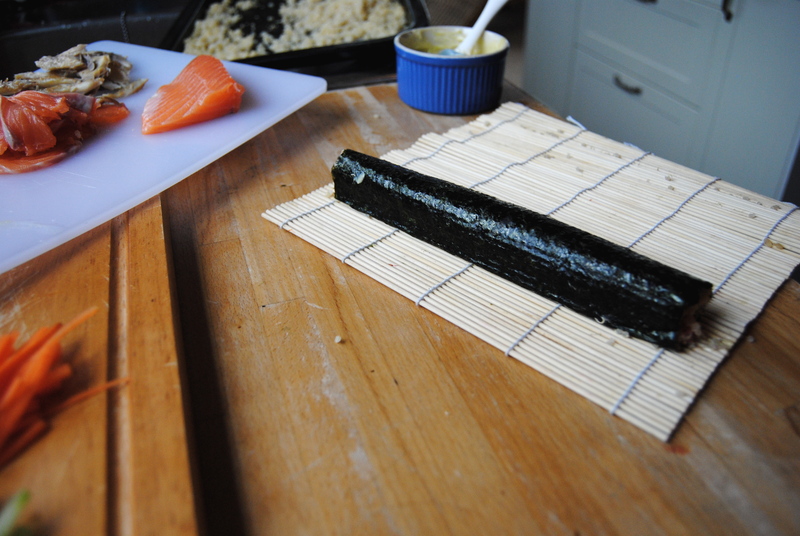 For inside-out rolls place your nori on the worktop next to the rolling mat and press on your rice, as instructed above but taking the rice all the way to the trimmed top edge. 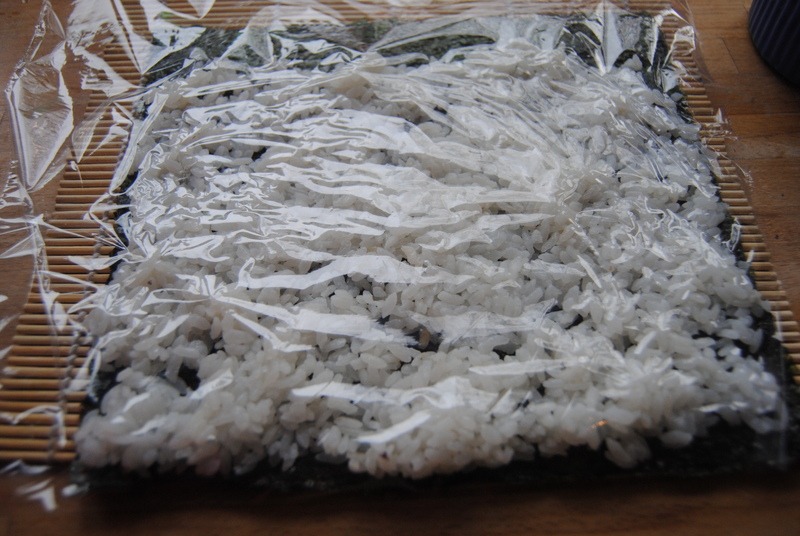 Now, if you are brave, carefully grab the two bottom corners and flip the rice-laden nori over onto the mat, aiming for the bottom edge to line up. 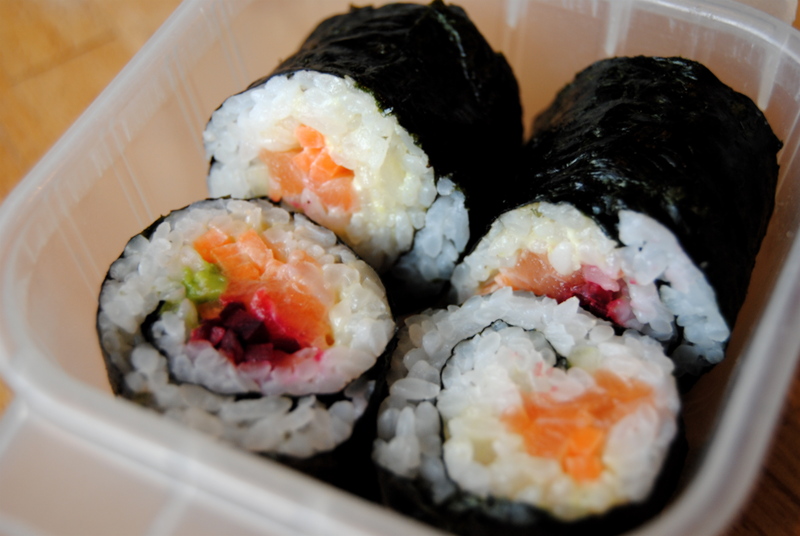 If you are less brave, press a piece of clingfilm over the sushi, lining up the bottoms and then flip. Doing it this way is trickier for rolling up as you need to ensure that you pull away the clingfilm as you roll, but some may find this easier to begin with. 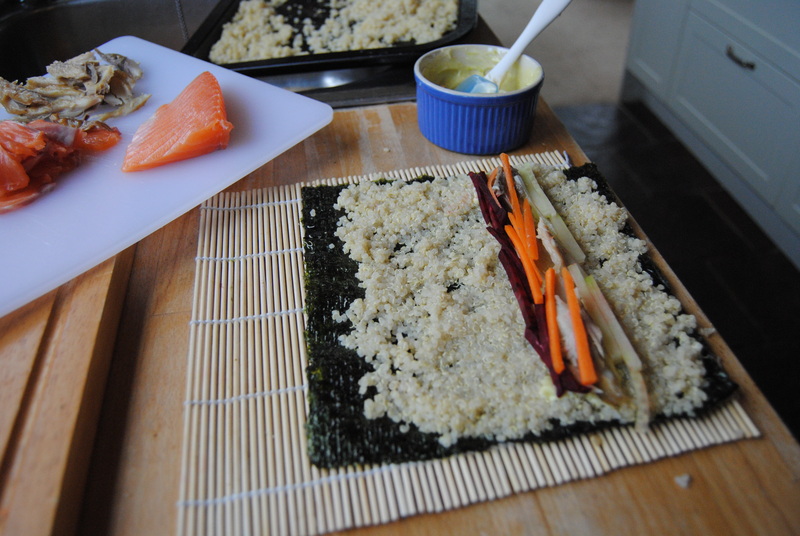 Now carry on with the filling but laying it directly onto the nori. 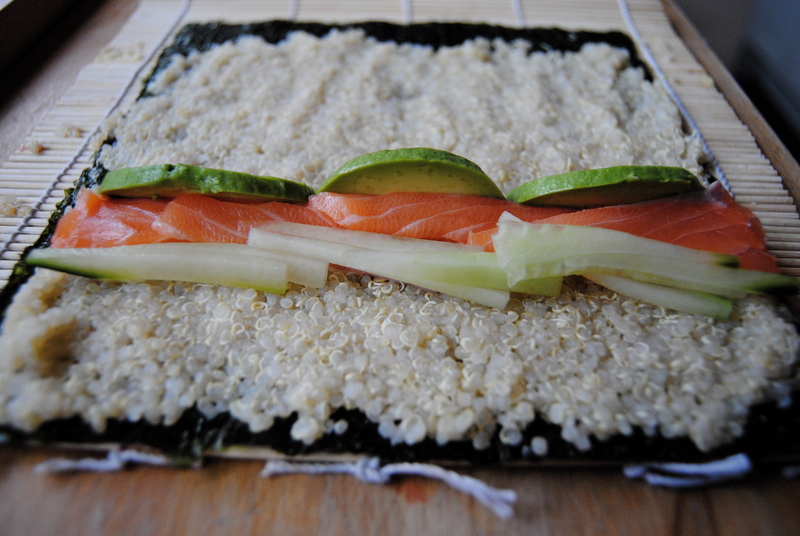 Roll up tightly, roll in sesame seeds if you like, and cut to your desire thickness. Now, attack with chopsticks! Quinoa option: Rinse 200 grams of quinoa in running water and bring to the boil in 400ml of water. Turn the heat to simmer, pop on the lid and cook until the water is absorbed. Cool and season as above. Makes a great, healthy snack for school too!